I live in Portland, OR, where rain and mud are typical conditions. A lot of golf shoes advertise that they are waterproof, but they really aren't. 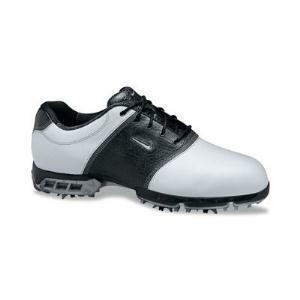 These Nike Men's SP-8 Tour Saddle Golf Shoes will definitely keep your feet dry. They even come with a 2-year waterproof warranty. What's more is they also come with a 45-day comfort warranty. The upper is made of very comfortable soft full-grain leather that has vents to allow your foot to breath. It is all one piece, which helps provide a great fit. Finally, the Nike Power Channel is a cool feature. This power channel helps give your golf swing power by freeing up your foot for optimum balance and a smooth weight transfer. The only thing I don't like about the shoe is it's a bit stiff and heavy. The problem with buying a shoe that is heavy duty enough to protect your feet is it usually takes a while before you can break it in. That being said, once you get the shoe broken in, you will enjoy all the advantages of this tour quality shoe.